“Angels“, “Gods“, “the beauty of the world“: is this what men actually are? If it were so, the societies we have built in time should have been able to express such perfection or at least some of them and we know it has not been so. If we were thus “noble in reason“, “infinite in faculty” the “piece of work” of creation, for what reason would we lock our doors at night? Thomas Hobbes believed that any idea of modern society should start from a realistic, rather than idealistic, analysis of the nature of man. His vision of mankind, in fact, takes the form of a sort of anthropological pessimism where human beings are all dominated by passions, greed, vainglory and distrust. These are the conditions that throw humankind into a permanent state of war, which is for Hobbes the natural state of human life, the situation that exists whenever those natural passions are unrestrained. A war where every individual faces every other individual as an enemy; the “war of every man against every man.” The consequent total absence of collaboration cannot but make us miserable and renders life “solitary, poor, nasty, brutish, and short.” Hence, rather than angels, it seems we act more like wolves: aggressive, violent, mean, selfish. Therefore; the Leviathan is but an artificial man, made in the image of its imperfect creator. The Sovereignty is its artificial Soul and gives life and motion to the whole body. The Joints are the Magistrates and other Officers of Judicature and Execution ; Reward and Punishment which are fastened to the seat of the sovereignty are the Nerves, The Wealth and Riches are the Strength of all the particular members ; the Counsellors are the Memory; Equity and Lawes are an artificial Reason and Will; Concord, Health. By the way, as any other man, the Leviathan is vulnerable and it experiences Sickness if there is a Sedition and a Civil War brings it to Death. We can feel Hobbes fears in these last words, in fact, the Leviathan was published in 1651, few years after the Civil War which had ended with the trial and execution of Charles I. By the way, the Leviathan must not necessarily be a king. 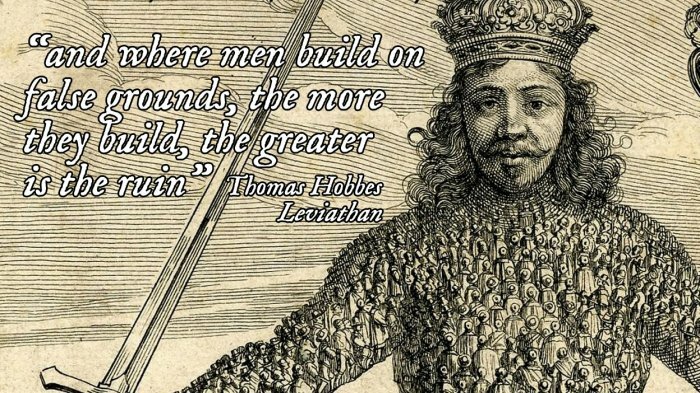 Hobbes makes clear that the sovereign power can be composed of one person, several, or many—in other words, the Leviathan can equally well describe a monarchy, an aristocracy, a democracy or even that republic made by Cromwell which rose from the ashes of the Civil War. The only requirement that Hobbes sets for sovereignty is that the entity has absolute power to defend the social contract and decide what is necessary for its defense. Just few questions: is Hobbes only a pessimist or did he get it right? Does only a Leviathan, whatever political form it takes, make us safely stay together and restrain our animal, aggressive nature? What would happen without such control? Well, just check any social network and as its presence has not been clearly outlined yet, you will see millions of hungry wolves running wildly, free and happy to have found a place to unleash their repressed nature at last.